I don’t know exactly when the word “fairytale” began to conjure up images of love and happy endings. That was, of course, my understanding of the term through infancy too, until my parents gave me a book of traditional Scottish fairy and folk tales. Gone were the sanitised and tame caricature villains in favour of the genuinely terrifying, unsettling, brutal, tragic, and evil. I often found my young and uninitiated mind terrified and haunted, and yet I found myself impulsively coming back for more, with my heart in my mouth and stomach tight with nervous excitement for the horrors the next tale would bring. I was completely hooked. I have since read many similar tales from around the globe, developing a particular fondness for reading the original (and brutal) stories that would evolve (or devolve, one may argue) into the safe and familiar stories presented – complete with bubble wrap, candy-floss colours, and all sharp edges removed – in children’s picture books and movies today. The Witch, or “VVitch” as appears on the posters (a common Jacobean spelling from the time in which the story is set), is one such tale. Whilst the story is an original rather than a historical tale, director Roger Eggers – a fellow lifelong aficionado of folk tales in general and those of witches in particular (somewhat unsurprisingly) – has made every effort to ensure that The Witch is as ‘traditional’ a folk tale as they come: The language is true to the period, with some dialogue even taken directly from historical source materials including court records and journals; the storyline itself also inspired by both fictional and “historical” accounts of witchcraft, no doubt including many of the tales I so loved throughout my youth. Eggers collaborated extensively with historians from both British and American museums to make the film as historically accurate as possible, going as far as consulting experts on historical agriculture to make certain that the family’s farm was just as any would have been at the time. Despite the film’s setting, farming can hardly be considered one of the film’s themes and we are only ever given fleeting glimpses of any such activity, a reflection of Eggers’ dedication to getting every detail just right. I personally loved the myriad small but significant details such as the characters’ delivery of early-modern English in British accents, exactly how newly arrived settlers in the Americas would have spoken (something that may escape the attention of a lesser director of an American/Canadian co-production both set and filmed on the North American continent), and that the film was shot using exclusively the sources of light that would have been available to a real family in the 1600s, limiting himself to the sun during the day and candlelight and moonlight after dark. I can’t help but think that this is as close to time travel as we have available to us at the moment. Whilst I am yet to hear any criticism of the film’s artistic style or cinematography (and rightly so, may I add, for it is a visually stunning work of cinema), having spoken to some less enthused by the film’s plot it has occurred to me that some might have gone into the movie expecting a more conventional horror film, or more specifically something more contemporary in themes. 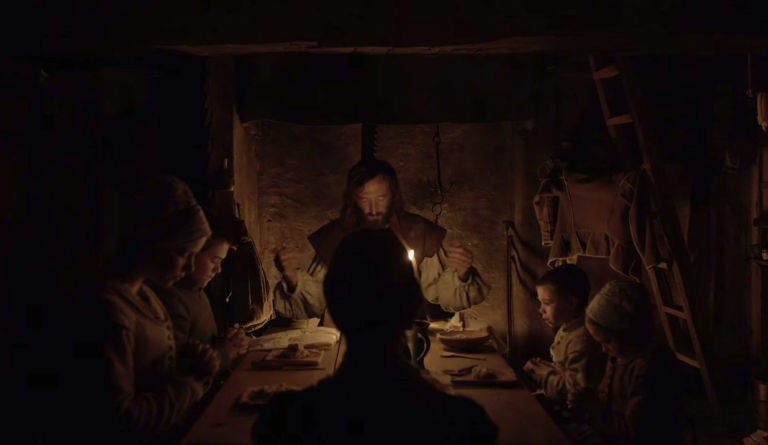 I watched The Witch with my mum on a recent visit – my first trip south since moving to Glasgow late last year – and having left film selection up to her, knew little to nothing about it prior to watching it, with the exception of its tagline: “A New-England Folktale”. Perhaps I have this to thank for my getting exactly what I had expected: A folktale (rather more specific and a slightly different concept in my mind to that conjured by the term “horror film” as The Witch is listed on streaming or review sites, and even referred to in the trailer). As I said before, folk tales were often scary, but they were not intended to scare the audience of the 21st century silver screen; the tales that inspired this story were written by candlelight by men and women to whom a witch was not just a spooky concept but a genuine threat: it is estimated that some 50,000 witches were hung, drowned, and burned over several hundred years across Europe and the American colonies, with 17th century New England – the setting of the infamous Salem Witch Trials amongst others – no exception. Some things you should know before you watch this movie, if you have not done so already: The story moves slowly; antagonists hardly ever appear on screen (though to great effect when they do); there are no jump scares, which interestingly added greatly to the movie’s tension for me as I occasionally found myself bracing for jump scares that never came, leaving an unresolved tension lingering in my gut (a sad reflection perhaps on the predictability of some modern cinema); and the film’s conclusion is perfectly realistic and logical only when considered through the eyes of someone living in the period in which it is set. To a modern viewer with a stubbornly contemporary view of the world expecting a modern horror movie this will be a recipe for disappointment, but if you can leave the trappings of the modern world behind for a couple of hours, I am sure you will agree that The Witch is a consummate work of art.